New Year’s Greetings in the BULLETIN! THERE’s STILL TIME TO SUBMIT YOUR GREETINGS! 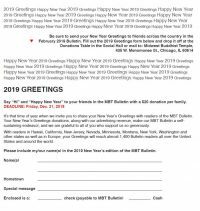 It’s that time of year when we invite you to share your New Year’s Greetings with readers of the MBT Bulletin. Your New Year’s Greetings donations, along with our advertising revenue, make our MBT Bulletin a self-sustaining endeavor, and we are grateful to all of you who support us so generously. With readers in Hawaii, California, New Jersey, Nevada, Minnesota, Montana, New York, Washington and other states as well as in Europe, your Greetings will reach almost 1,400 Bulletin readers all over the United States and around the world. Say “Hi” and “Happy New Year” to your friends in the Bulletin for a suggested donation of $20 per family. Your name(s) will appear in a special section of the February 2019 edition of the Bulletin. This is a terrific way to support the Bulletin! But remember the deadline for submissions is January 13, 2019. NEW THIS YEAR: You can now submit your Greetings form and make your donation online! Just follow the simple steps below. Of course, if you prefer the paper method we still support that! Choose which ever you’re most comfortable with – and thank you for your generosity. Step 1: Click the button and enter the information about your Greetings. Click the box below (we appreciate your help in preventing spam) then don't forget to click SEND! Step 2: Click the Donate button and you’ll be transferred to PayPal to complete your donation by entering an amount. The suggested donation is $20. Step 1: Click the image below for a printable version of the Bulletin Greetings form. Step 2: Fill out the form then mail it with your donation to Midwest Buddhist Temple, 435 W. Menomonee St, Chicago, Ill 60614. Please remember the deadline for submissions is Jan 13, 2019!